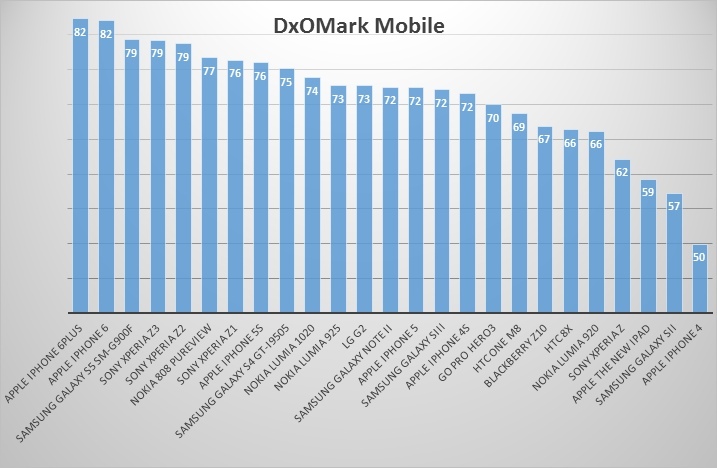 Achieving the highest overall DxOMark Mobile score to date of 82 points each, the Apple iPhone 6 and 6 Plus tie in first place wresting the coveted top spot from Samsung S5 and Sony Xperia Z3 /Z2 each with 79 points. Apple ’s new larger-size iOS 8 powered smartphones features some pretty compelling benefits including a new 8-Mpix sensor with on-chip phase detection pixels for faster autofocus and optical image stabilization on the 6 Plus. From our industry-standard series of tests both in the lab and real world use, the iPhone 6 and 6 Plus perform very similarly. They have very good, generally reliable auto-exposure in a wide range of lighting conditions and they have both fast and accurate autofocus. Output from the 8-Mpix stills improves the high level of detail in both outdoor and indoor lighting. In low light, noise reduction is handled well with images revealing fine-grained luminance noise and little of the distracting color (chroma) noise. The main differences between the 2 cameras come from Optical Image Stabilization (OIS) present in the iPhone 6 Plus. On one hand, the OIS helps to increase still images exposure time in low light, leading to better noise performance. Ghosting on HDR images also seems smaller with the iPhone 6 Plus, probably helped by the OIS that ensure a good registration between images. On the other hand, we have observed a video stabilization artifact, on the iPhone 6 Plus, most likely linked to the OIS control that lead to a video stabilization score slightly lower for the iPhone 6 Plus than for the iPhone 6. Equipped with a new 5.5-inch Retina HD display with 1920×1080 pixel screen the 6 Plus has the slightly higher resolution panel at 401 ppi over the smaller 4.7-inch 1334 x 750 (326 ppi) display of the iPhone 6. Both displays have stunning clarity, high contrast, excellent color and wide viewing angles, which is promising for viewing (and editing) stills and video on the go. Video capture doesn’t include 4K but both feature 1080p at 60 fps with slow-motion options at 120 fps and 240 fps. However, while the longer battery life of the larger iPhone 6 Plus looks more appealing that of the smaller iPhone 6 the debate has started about the larger model’s suitability for discreet street photography. Impressive autofocus both in low light and bright light. Good detail preservation outdoors and indoors. Good performance with flash: good exposure, stable white balance, good color rendering, low noise level and good detail preservation. Luminance noise visible in low light conditions (iPhone 6 only). 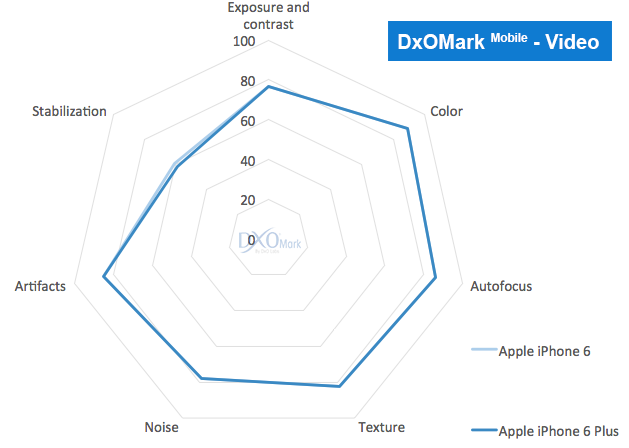 In addition iPhone 6 has some ghosting and fringing. Autofocus is very fast, accurate and repeatable. 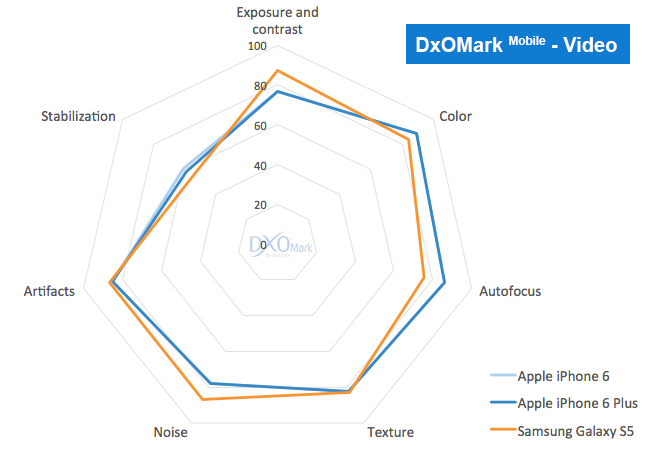 Best ever tested by DxOMark Mobile team, at the time of testing. Excellent stabilization in good lighting conditions. Attractive color in wide range of lighting. As both models share the same new type 8-Mpix CMOS sensor, complete with on-chip phase detect pixels the image quality is, perhaps unsurprisingly very similar indeed. 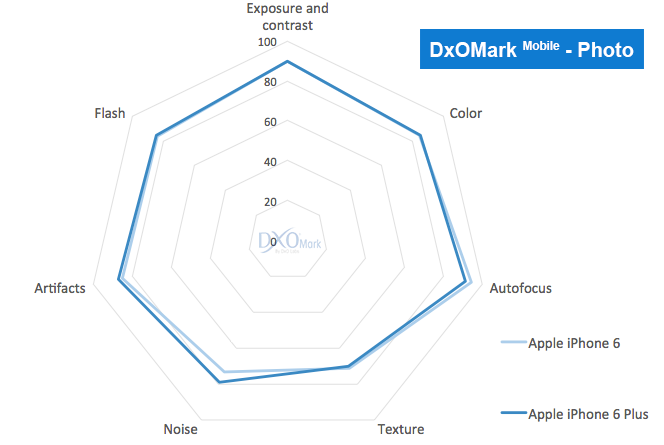 The overall autofocus performance of both models remains impressive compared with rival offerings: reliable and precise in both bright and low-light levels thanks to the phase detect pixels. In our outdoor tests under bright light, both models are capable of delivering sharp detailed images right across the frame, and noise is very low even in large expanse of single tones, such as blue sky. The five element f2.2 Tessar type lens is a good performer but, as you might expect sharpness is greater in the center than the periphery. White balance and exposure inaccuracies were rare and images were well exposed with appealing colors; any errors occurring mainly in extreme low light conditions. Color shading outdoors was negligible, however, under fluorescent artificial lighting some color shading was noticeable leading to green tint centrally and a complementary pink tone in the corners. The two models produced generally pleasing skin tones though under tungsten lighting a reddish cast was noticeable. Skin tones look natural under D50 illuminant (left) but a reddish tint is visible under tungsten illuminant (right). We have observed some ghosting, fringing and color quantification that were not present in previous versions of the iPhone, these new artifacts are the price to pay for an automatically triggered HDR mode that does improve exposure at the expense of these new artifacts. Moiré is also noticeable at times, albeit mostly at 100% magnification (actual pixels). In low light (20 lux) fine detail remains visible although inevitably the presence of fine grained luminance noise in uniform areas is noticeable, but not excessively so. 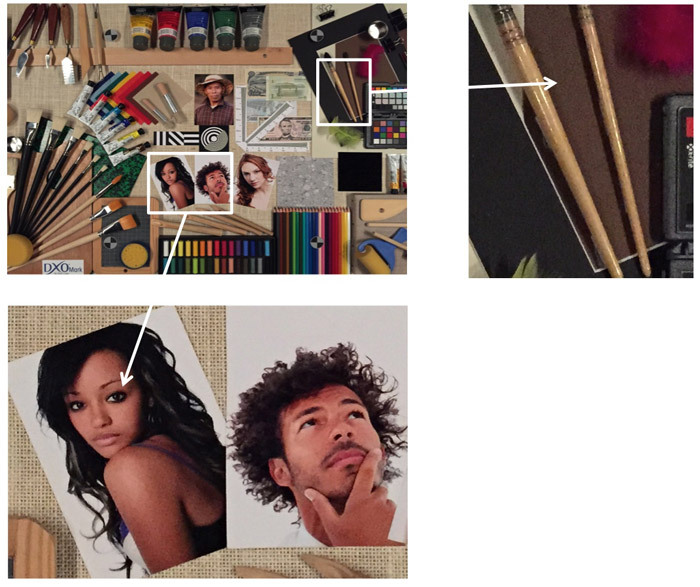 If tempted to switch from artificial lighting to the iPhone 6 models’ built-in flash we found that while they perform equally well, at our usual shooting distance they exposed accurately in the centers of the frame and delivered pleasing colors, even when mixed with tungsten light, though the corners remained noticeably darker. This isn’t unusual, though given the size and power output of the flash units. While the iPhone 6 and 6 Plus lack 4K, which is found on some rivals, we found the quality of HD footage captured to be very impressive. 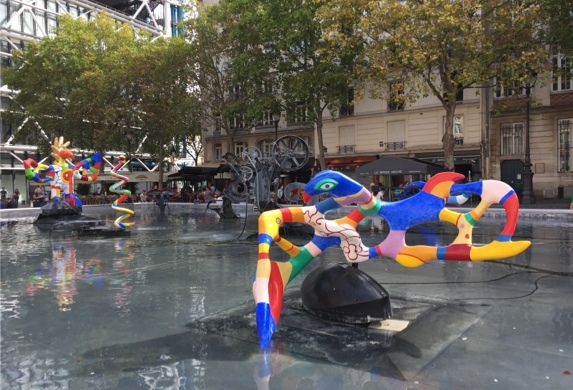 Video quality can vary tremendously across various makes but the iPhone 6 models deliver clips with nicely rendered well-saturated color and generally accurate white-balance. Noise is noticeable in low light levels but that’s to be expected. Images show some color speckled chroma type noise particularly in uniform areas but it’s low; most noise is in the form of fine-grained luminance type instead, which is less distracting and generally more acceptable. Exposure accuracy is very good, although under certain lighting conditions (exceptionally low light levels) it can be unreliable. As we’ve already noted the five-element lens used performs very well. Fringing remains very low and flare can be seen occasionally when bright light sources are included in the frame but otherwise the lens is very capable. 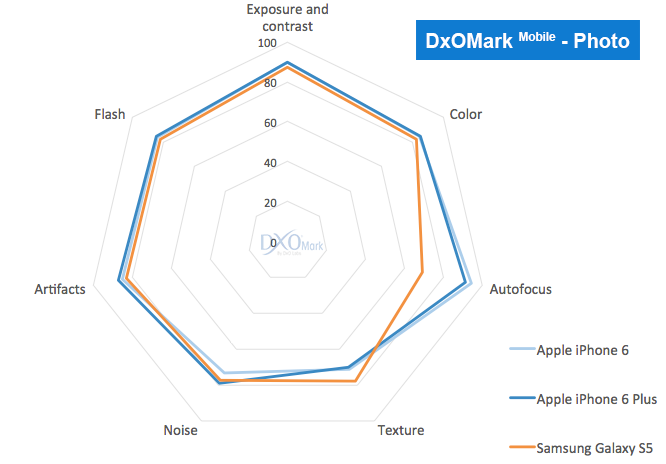 Autofocus remains very fast and is both accurate and stable under all test conditions; bright and low light. Digital stabilization is used in both models and in good lighting video clips are well stabilized, even during our torturous walking test. However, it’s not a stretch to imagine that stabilization is less efficient well under low-light, and that’s the case here unfortunately when it’s needed most. Phase detection autofocus is more than a tagline, it does deliver significant improvement in image and video quality. It is fast, smooth and repeatable. Photo: Autofocus, texture and noise improvement. – Texture and noise score were improved significantly which means more details in every shooting conditions. – The only drawback are some artifact caused by HDR (activated by default on the 6 and 6 Plus). Phase detection autofocus is more than a tagline, it does deliver significant improvement in video quality. It is fast, smooth and reapeable. 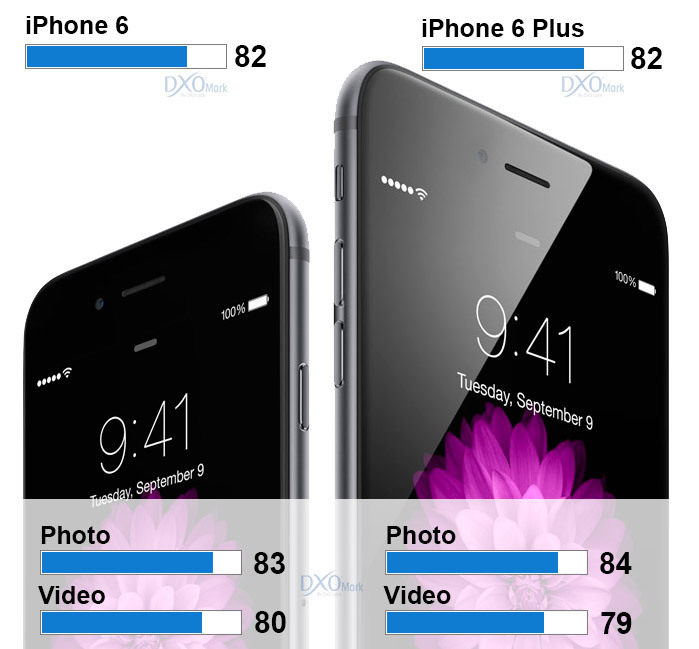 The difference in score is huge for video evaluation where iPhone 5S autofocus was far behind the best device and the iPhone 6 / 6Plus autofocus is now clearly leading competition. The iPhone 6 and 6Plus are very well rounded device without any strong weaknesses, so the great autofocus that is clearly leading today’s competition directly translates into a lead in the overall score. 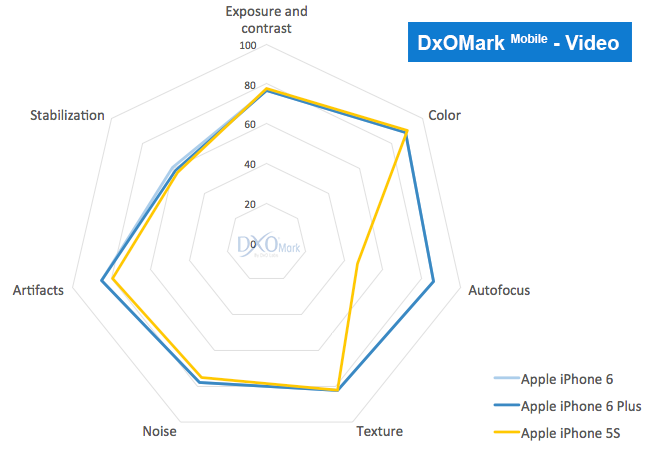 It is also worth noting that Apple is making great use of the 8 MPix with only a slight loss in texture score (details preservation) compared to competition with 13 Mpix, 20MPix or 36 MPix that don’t prevent them from taking the lead in overall score. 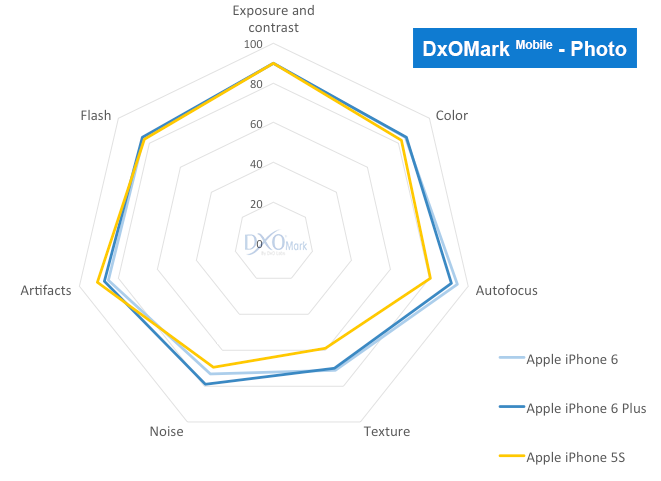 – Overall, the 3 smartphones scores are very close but autofocus make the difference: with same technology (autofocus with phase detect pixels) the Apple devices provide a more reliable and faster system. Stay tuned…we will follow up with deeper analysis of these great devices!